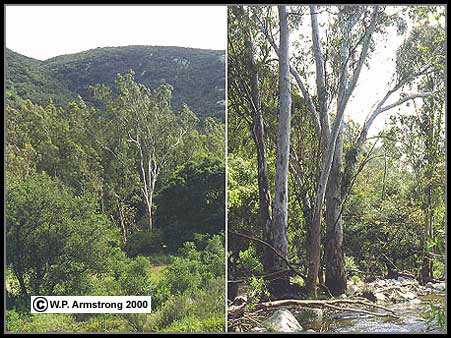 Escondido creek in northern San Diego County is lined with large red gums (Eucalyptus camaldulensis), an Australian tree naturalized throughout riparian habitats in California. In some areas it has replaced native trees and shrubs that once flourished in streamside woodlands. Until 1998, red gums didn't have any significant natural predators to control its rampant growth in California. 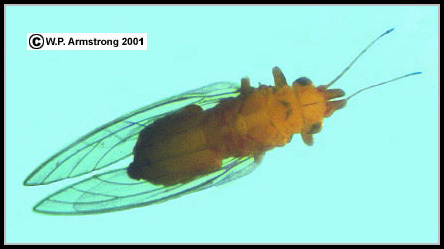 As of March 2000, this species is now being defoliated by the red gum lerp psyllid (Glycaspis brimblecombei), an Australian insect discovered in Los Angeles County in 1998. The dense, brush-covered mountains in the distance are dominated by native chaparral species. This photograph was taken in 1998, before the red gum lerp psyllid reached epidemic proportions in San Diego County. One of the most common naturalized species of eucalyptus throughout central and southern California is the red gum (Eucalyptus camaldulensis), also known as E. rostrata. This species is a prolific seeder and has literally taken over canyons and river valleys where sufficient moisture can support groves of these large forest trees. 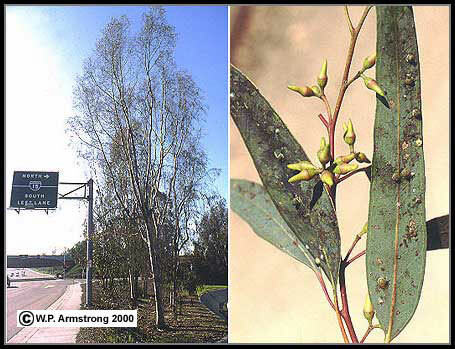 Red gums seemed immune to any insect predator, that is until 1998 when the leaves of a tree in Los Angeles County were found to be infested with the red gum lerp psyllid (Glycaspis brimblecombei), an Australian insect that severely defoliates this species of eucalyptus. A severely defoliated red gum (Eucalyptus camaldulensis) in northern San Diego County, California. The leaves are infested with the red gum lerp psyllid (Glycaspis brimblecombei), an Australian insect discovered in Los Angeles County in 1998. The wingless, yellowish immature form (nymph) secretes a waxy protective cover called a lerp. Several whitish-gray lerps are visible on the leaves in this photograph. The nymphs also secrete large amounts of sticky honeydew on the leaves which results in blackened foliage due to the growth of sooty mold. Defoliated red gums (Eucalyptus camaldulensis) at the San Diego Zoo. The leaves are infested with the red gum lerp psyllid (Glycaspis brimblecombei), an Australian insect discovered in Los Angeles County in 1998. The severely defoliated tree at right is in the Javan Banteng enclosure on Horn and Hoof Mesa. [The Javan Banteng is an endangered type of wild cattle native to Malaysia.] The faint basket in the sky is the Skyfari which travels directly over these trees. Psyllids are also called jumping plant lice and belong to the Order Homoptera, along with scale insects, aphids and cicadas. In fact, they superficially resemble a miniature cicada except they are the size of aphids (less than 4 mm long). 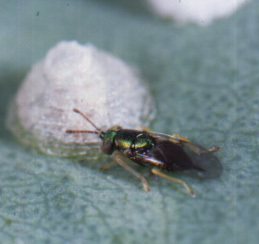 Both immature and adult psyllids feed by sucking plant juices out of the leaves, causing serious leaf drop which weakens the trees and makes them more susceptible to other pests, such as wood-boring beetles. The wingless, yellowish immature form (nymph) secretes a waxy protective cover called a lerp. "Lerp" is a term derived from an aboriginal Australian language describing this cover. The nymphs also secrete large amounts of sticky honeydew on the leaves which results in blackened foliage due to the growth of sooty mold. 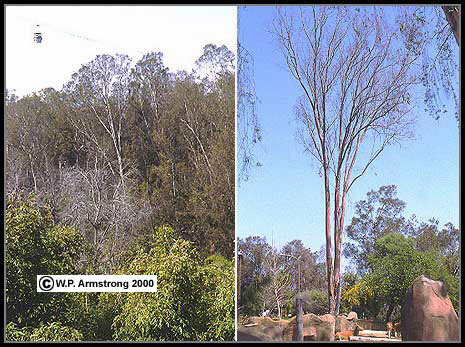 This insect infestation has rapidly spread throughout Los Angeles, Orange and San Diego Counties, and by March 2000 was causing major defoliation of red gums. A tree that once thrived in this region without any major insect predators is now facing a serious threat to its survival. In Australia, the red gum lerp insect has a specific natural predator that controls its population growth. The predator is a tiny parasitoid wasp (Psyllaephagus bliteus) that is small enough to sit on the head of an ordinary straight pin. The female wasp kills the lerp insects by depositing eggs inside them with her ovipositor. [The stinging devices of other wasps are modified ovipositors.] This wasp has been introduced into eucalyptus groves in southern California during the summer of 2000. Entomologists are optimistic that the wasps will spread to other lerp infested areas of the state and stop the widespread destruction of these trees. Hopefully the introduction of these parasitic wasps will not result in "nontarget effects," where other beneficial species are also attacked. Leaves, buds and seed capsules of the red gum (Eucalyptus camaldulensis), a common naturalized species throughout central and southern California. The leaves are infested with the red gum lerp psyllid (Glycaspis brimblecombei), an Australian insect discovered in Los Angeles County in 1998. The wingless, yellowish immature form (nymph) secretes a waxy protective cover called a lerp. Several whitish lerps are visible on the leaves in this photograph. The nymphs also secrete large amounts of sticky honeydew on the leaves which results in blackened foliage due to the growth of sooty mold. 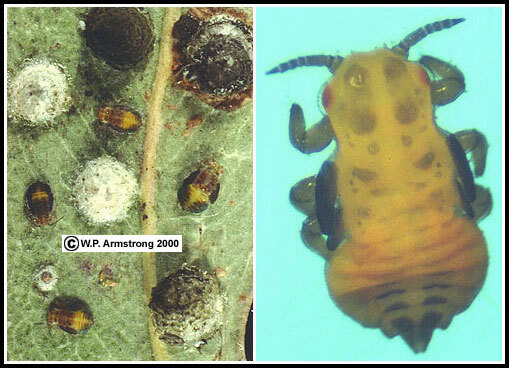 Left: Close-up view of the leaf of a red gum (Eucalyptus camaldulensis) infested with the red gum lerp psyllid (Glycaspis brimblecombei), an Australian insect discovered in Los Angeles County in 1998. The photo shows several stages of immature nymphs, some with tiny developing wings. The nymphs secrete a waxy protective cover called a lerp. Several whitish lerps are visible in this photograph. The nymphs also secrete large amounts of sticky honeydew on the leaves which results in blackened foliage and lerps due to the growth of sooty mold. Right: Magnified view of a lerp nymph showing cicadalike head and eyes, and developing wings. Magnified view of a winged, adult lerp psyllid (Glycaspis brimblecombei), an Australian insect discovered in Los Angeles County in 1998. Because of its exponential population growth and ability to fly, this little insect has literally spread throughout California in less than four years. Without any natural predators from Australia to control its population growth, it has devasted groves of red gums throughout the state.